USS MOBILE BAY was built in Pascagoula, Mississippi, by Ingalls Shipbuilding Division of Litton Industries. The cruiser was commissioned on 21 February 1987 at the Alabama State Docks in Mobile, Alabama. 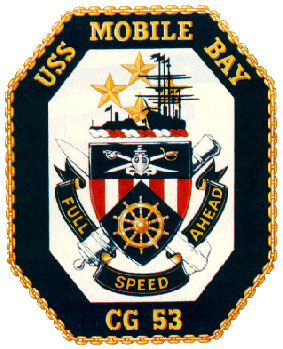 After commissioning, MOBILE BAY joined the U. S. Atlantic Fleet, arriving at its Mayport, Florida, homeport in March 1987. Following a year of crew qualifications, tests and systems trials, MOBILE BAY embarked on its maiden deployment on 11 May 1989. During this cruise, MOBILE BAY earned its first two awards: the Sea Service Deployment Ribbon and the Armed Services Expeditionary Medal, for operations conducted in the Gulf of Oman. 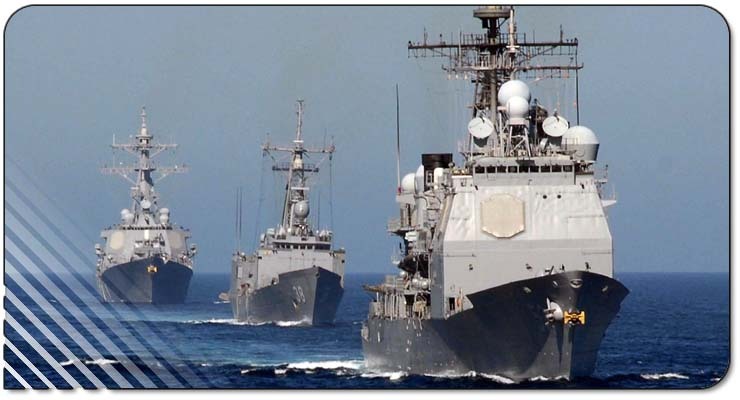 In June of 1990, MOBILE BAY shifted homeports from Mayport, Florida to Yokosuka, Japan. Shortly thereafter, MOBILE BAY deployed in August 1990 in support of Operation Desert Shield and Storm, becoming the first Aegis cruiser to circumnavigate the globe. In the Arabian Gulf, the ship distinguished itself by becoming the first Battle Force Anti-Air Warfare Commander to control a four-carrier Task Force. MOBILE BAY launched 22 Tomahawk land-attack cruise missile strikes, and controlling carrier-launched attack aircraft that contributed to the complete destruction of the Iraqi Navy. In May 1993, MOBILE BAY steamed to Western Australia for SPRING TRAINING-93, a multi-national exercise involving units of the U. S., Royal Australian, and Singaporean Navies. In September of 1993, MOBILE BAY made an historic visit to the Russian seaport of Vladivostok. Departing Russia, MOBILE BAY participated in ANNUALEX-93 before returning to Yokosuka to finish preparations for an upcoming Indian Ocean and Arabian Gulf deployment. Border:A continuous anchor chain signifies a unity of purpose and teamwork; the elongated octagonal band suggests the unique, primary radar associated with the AEGIS system. The Shield: The shield, located in the center of the crest, contains a ship's wheel and crossed cutlass and sword. The wheel represents naval leadership on the oceans of the world. The modern ship, crossed swords, and cutlass signify professional expertise and the spirit of the Surface Warfare community from which the ship's officers and crew are drawn. A naval cannon, typical of armaments used in the Battle of Mobile Bay, supports the shield and symbolizes ancient and modern weaponry. The Crest: The Battle of Mobile Bay is recalled by the silhouettes of the steam sloop USS HARTFORD and CSS TENNESSEE. The former was the flagship of Admiral David Farrugut's Federal Fleet and the later a ram of the Confederate Navy. The four stars reflect Admiral Farragut's commission as the Navy's first four-star admiral.